In this heartwarming novel from the bestselling author of Must Love Dogs and Wallflower in Bloom, a recently separated woman faces her highway driving phobia and takes a road trip with her best friend to their high school reunion. Years ago, Melanie followed her husband, Kurt, from the New England beach town where their two young sons were thriving to the suburbs of Atlanta. She’s carved out a life as a successful metal sculptor, but when Kurt leaves her for another woman, having the tools to cut up their marriage bed is small consolation. She’s old enough to know that high school reunions are often a big disappointment, but when her best friend makes her buy a ticket and an old flame gets in touch to see whether she’ll be going, she fantasizes that returning to her past might help her find her future…until her driving phobia resurfaces and threatens to hold her back from the adventure of a lifetime. I had the privilege of meeting Claire Cook in June. Of course I had seen the movie Must Love Dogs, but I am ashamed to admit I had not read the book the film was based on nor any of the author’s other works. 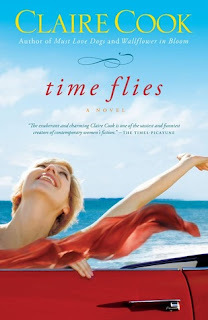 I have since remedied that situation, devouring my (autographed) copy of Time Flies. The premise resonated very strongly with me. A divorced woman “of a certain age,” I could relate to so many of the situations Melanie wrestled with during the course of the book: dealing with the ex, maintaining a relationship with her grown children, the hope of rekindling an old flame, the awkwardness of new love, the desire to be many pounds lighter (and at least as many years younger) overnight. Luckily, Melanie is blessed with B.J., the kind of best friend we all wish we had: one who pushes us out of our comfort zones, calls us on our doody, and knows how to have a good time. So when it’s time to leave for their high school reunion, B.J. doesn’t take no for an answer. Oh, how I wanted to be on that road trip with them, gobbling French fries and drinking Tab at every rest stop! This book totally lived up to its promise: “an epic trip filled with fun, heartbreak, and friendship that explores what it takes to conquer your worst fears…so you can start living your future.” Five enthusiastic stars! Highly recommended!